There has never been a better time to invest in a Card Connection Franchise. Successful Franchisees can generate in excess of £50,000 profit per year owning a Card Connection Franchise. A Card Connection franchise allows you to buy into an established company and a proven business idea. Franchisees enjoy the flexibility of being their own boss but with the knowledge and dedication of an established and highly successful organisation behind them. 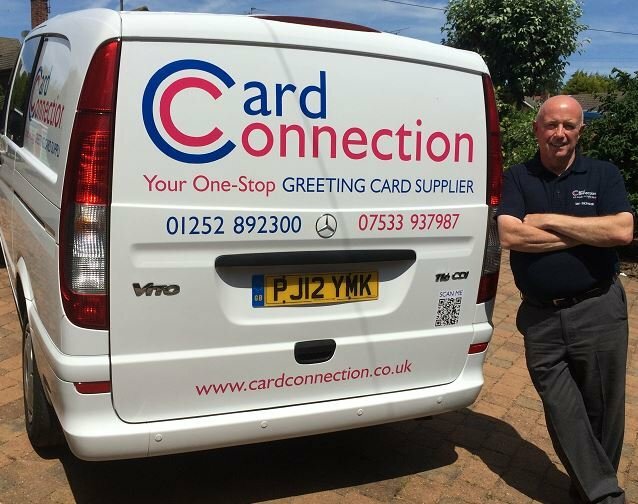 Card Connection is part of one of the world’s largest card publisher and is the UK’s market leader in the franchised distribution of greeting cards. Card Connection franchisees supply greetings cards to retail outlets on a ‘consignment’ basis. This is one step beyond ‘sale or return’ as retail customers don’t have to buy the stock initially; they only pay for what they sell. This proven, award-winning business model has enabled hundreds of franchisees to run successful businesses since the early 1990’s. Typically franchisees call on retail customers on a monthly basis to re-stock and merchandise products. Customers include convenience stores, sub post offices and petrol station forecourts. In addition Card Connection franchisees supply numerous National Accounts which include the likes of BP, Spar and Costcutter. Card Connection franchisees have their own exclusive territory with an extensive customer base. Franchisees will earn immediate income from day one using a portfolio of unique, quality products. Working from home, all you need is a good sized garage (or equivalent) for stock, a van, mobile phone, iPad, plenty of enthusiasm and passion. Card Connection will supply all of the necessary training plus a detailed hand-over which will include an introduction to every single customer which helps ensure the new franchisee gets off to a great start. Territories currently available are: Bournemouth, Exeter, Plymouth, Gloucester, Bath, Birmingham, Cardiff, Stoke on Trent, Peterborough, Liverpool, Lake District and Fife/Edinburgh/Scottish Borders. Card Connection is part of UK Greetings, which is a subsidiary of American Greetings Inc., one of the largest greeting card publishers in the world. Since the franchise network in the UK is complete, the available opportunities now consist of acquiring an already-established territory from an existing franchisee. These vary in price according to their level of development, but start at £35k + Stock + Card Connection fee with earnings potential in excess of £50k per annum.